A contemporary experience is yours to discover at the Renaissance Amsterdam Hotel. An ideal destination for both business and leisure travelers to the Netherlands, as this hotel boasts a prime location in the heart of central Amsterdam. Make yourself at home in the stylish guest rooms offering plush bedding and flat-screen TVs. Indulge in skillfully crafted Italian fare at Scossa, the on-site restaurant, or challenge yourself to a workout in the fitness center. 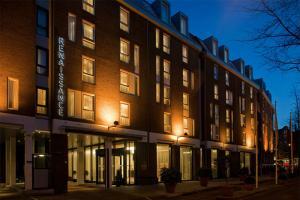 Popular attractions near this hotel include the Anne Frank House. Located a mile from Royal Palace on Dam square, and 7 miles from Schipol Airport. Royal Palace on Dam Square, Anne Frank House, Van Gogh Museum, Nine Streets Shops, Opera House/Music Theater, Canal Cruises, Heineken Brewery, Artis Zoo, Madame Tussaud's Wax Museum are all less than 6 miles from the hotel.